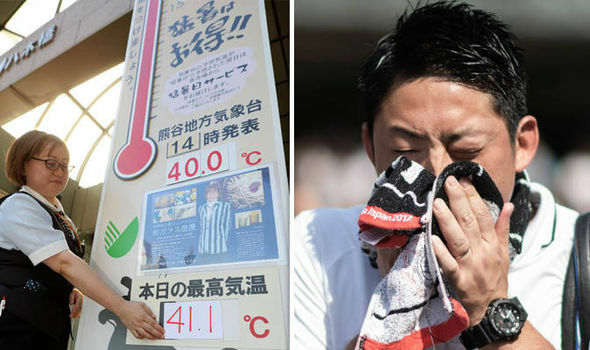 Japan on Monday posted a record high temperature of 41.1 degrees Celsius in the city of Kumagaya, the highest temperature ever recorded in the country, according to the Meteorological Agency. Japan has been hit by a heatwave this month, with dozens of people reportedly dying of heatstroke, including three on Monday. Most of the victims have been elderly. According to the agency, the temperature rose above 40 degrees in the prefectures of Gifu, Saitama and Tokyo. A 90-year-old man was among Monday’s victims, according to Kyodo News. He was found unconscious before dawn in the city of Chichibu, north of Tokyo, and pronounced dead at a local hospital. On Sunday, temperatures had risen above 35 degrees Celsius in 237 monitoring points out of 927 areas, which the Meteorological Agency said was the largest number this year. The Tokyo Fire Department said that 3,125 ambulances were dispatched in the capital on Sunday, the largest on a single-day basis since it started emergency medical operations in 1936. Authorities have urged the public to take precautions, such as ensuring adequate hydration and avoiding unnecessary outings. The agency has predicted the heatwave will continue to hit the country until the end of July. floods and landslides earlier this month. The sweltering weather has hampered recovery efforts in many of the disaster-stricken areas.